Fir Needle essential oil, Douglas, WC, Argentina is back and better than ever. The evergreen aroma is unique and more refined than any other. As an Aromatherapy blending component it will add great class and beauty. This is our lowest price in several years. World production is low on this Fir Needle: Under a ton. Used in massage, it helps relieve muscles after exercise. * The aroma can be spiritually focusing. 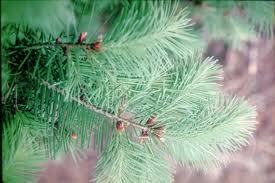 Douglas Fir oil is antitumoral, anticancerous, antifungal, is an antioxidant, and combats respiratory infections. Wild Crafted - the best quality, therapeutically. Body Systems Affected: Emotional balance, muscles and bones, nervous system, respiratory system. Uses: Douglas fir essential oil may be beneficial for asthma, bronchitis, chronic coughs, depression, hemorrhoids, stress-related conditions, urinary infections and cystitis. It may enhance the production of hGH (human growth hormone) and reduce cortisol levels. It is very soothing on overworked and tired muscles, ligaments, tendons and joints. Historical Uses: The Douglas Fir tree has been highly valued for it's fragrant scent, it has also been praised for it's medicinal virtues in helping with respiratory complaints, muscular and rheumatic pain. The oleo-resin from the Douglas Fir tree has been used for the external treatment of burns, sores and coughs. Properties: Antiseptic for genito-urinary and pulmonary), astringent, diuretic, expectorant and sedative for nerves. Aromatherapy Effects: Douglas Fir essential oil is highly valued for it's grounding effects and feelings of empowerment. It is very appeasing, and emotionally balancing. Scent: Fresh, clean, balsamic, coniferous and sweet. How to use: Apply to Vita Flex points and/or directly on area of concern. Dietary Supplement Uses: When using as a supplement, dilute one drop in 4 fl. oz. of liquid such as goat's or rice milk or 1 drop in a tsp. of honey. Approved by the FDA as a Food Additive (FA) and as a Flavoring Agent (FL). Safety: Can irritate sensitive skin. Avoid direct sunlight for 3 - 6 hrs. after use. Do not use on children under 6 yrs old. For children 6 years and older use with caution and greater dilution. Suggested Blending Oils: German chamomile, cedarwood, cypress, frankincense, juniper, lavender, lemon, myrtle, pine, sandalwood and rosewood.